00:22:04 Retweeted @stevenportnoy 00:04:59 By voice votes, the House and Senate have voted this wk to make the bison the official national mammal. Bill now heads to Obama's desk. 02:47:00 Just noticed the Powerball jackpot is $π*10^8. Woo! Of course, it will probably change before I win it. Oh well. No need for a ticket then. 04:51:09 Anti-Trump protesters getting violent is about the most counterproductive thing I can possibly think of. Only strengthens Trump. Sigh. 06:43:56 Unfortunately @ElectionGraphs has to call it a night. There will be a check for estimate updates in the morning, as well as blog posts. 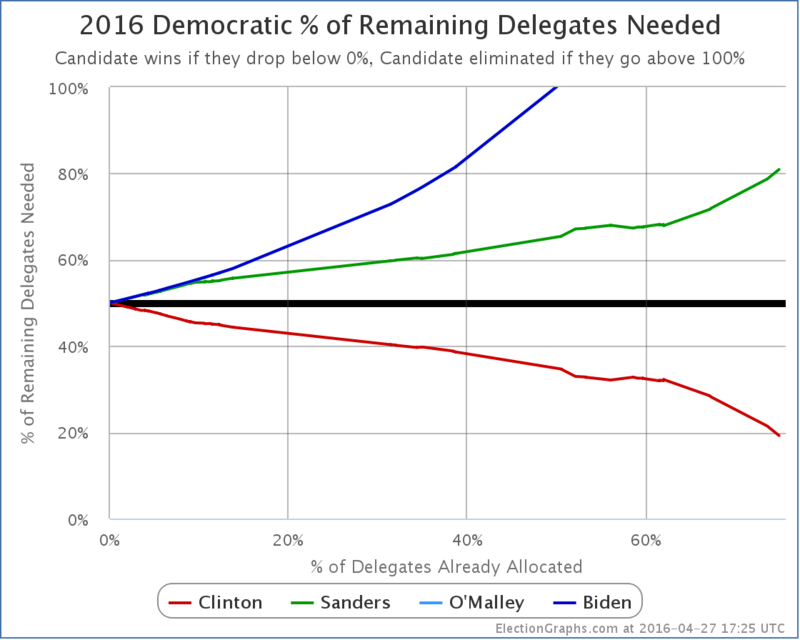 00:43:45 As usual, I’ll be doing hourly delegate estimate updates on https://t.co/XU2w1Pstlc – Follow @ElectionGraphs for details each hour. 19:41:49 Blog posts on yesterday’s results in both parties now up at @ElectionGraphs. 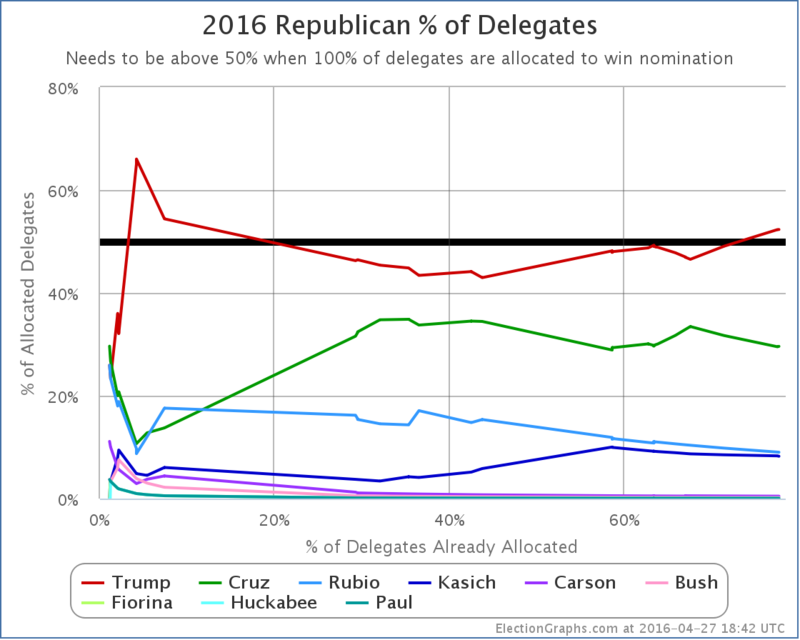 00:43:37 As usual, I’ll be doing hourly delegate estimate updates on https://t.co/MZrA9dFRue – Follow @ElectionGraphs for details each hour. 01:31:36 Retweeted @Taniel 01:28:52 Wow, didn't expect this: In PA's CD17, in an 11-candidate field, 3 candidates on Trump's slate all have twice as many votes as anyone else. 01:32:42 Retweeted @davidplouffe 01:27:07 First Trump-Clinton debate will be global phenomenon. 01:36:33 Main thing to watch since Clinton/Trump wins all expected… The 54 uncommitted Rep dels. 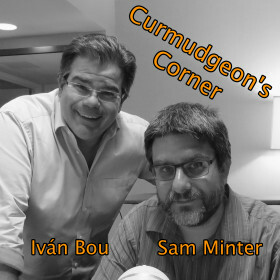 How many can be identified for a cand, and which? 03:27:16 Still waiting 4 more solid info b4 including preferences for the 54 unbound PA dels over at @ElectionGraphs, but looking like most Trump. 03:28:46 Trump was expected to win tonight, but he exceeded expectations in del count, even w/o unbound. With them, #NeverTrump in deep deep trouble. 03:32:45 Retweeted @MileHighBrendan 03:32:02 If Trump wins Indiana, is there still time for #NeverTrump to mount credible 3rd party bid, or is it down to #ImWithHer or #FeelTheJohnson? 06:46:30 Trump’s night much better than expected. With both pledged and uncommitted dels. Details at @ElectionGraphs. #NeverTrump in deep trouble. 06:48:54 Retweeted @ElectionGraphs 06:43:56 Unfortunately @ElectionGraphs has to call it a night. There will be a check for estimate updates in the morning, as well as blog posts. 18:40:22 Retweeted @imbou 18:40:12 Since everyone is naming hypothetical running mates, I nominate @abulsme as my running mate!!!! Trump did very well yesterday in PA/MD/CT/RI/DE. In pledged delegates the results were Trump 110, Kasich 5, Cruz 3. That is a crushing win, but that is not why I say everything is falling into place. Trump did a little better than expected in pledged delegates, but a massive Trump win had been expected for awhile. This was not a surprise, and was already baked into people’s projections for the rest of the race. Even with this built into the expectations, as of my post last week we were looking at odds between about 40% on the low side and 64% on the high side for Trump actually getting to 1237 delegates and having an outright majority before the convention. A week later, several things change that and make an outright Trump win look far more likely, and a multi-ballot convention much less likely. If it isn’t the pledged delegate results from last night, then what is it? The first thing is the officially uncommitted delegates from Pennsylvania. In past contests Trump has done a horrible job getting his loyalists into the slots that are nominally uncommitted, or for that matter even into the slots that are bound to him on the first ballot. It was plausible to expect that Trump would do similarly poorly with Pennsylvania’s uncommitted delegates which are elected by name on the ballot… without any indication on the ballot of who they support. But Trump appears to have gotten his act together, making sure delegate slates were available to Trump supporters and such. Between delegates that explicitly said they support Trump, and those who said they would vote the way their district went (and all of them went for Trump), Trump ends up with 45 of the 54 uncommitted delegates by my estimates. There is some ambiguity in the statements made by some of these uncommitted delegates and some other folks have estimated the number of Trump votes slightly lower. 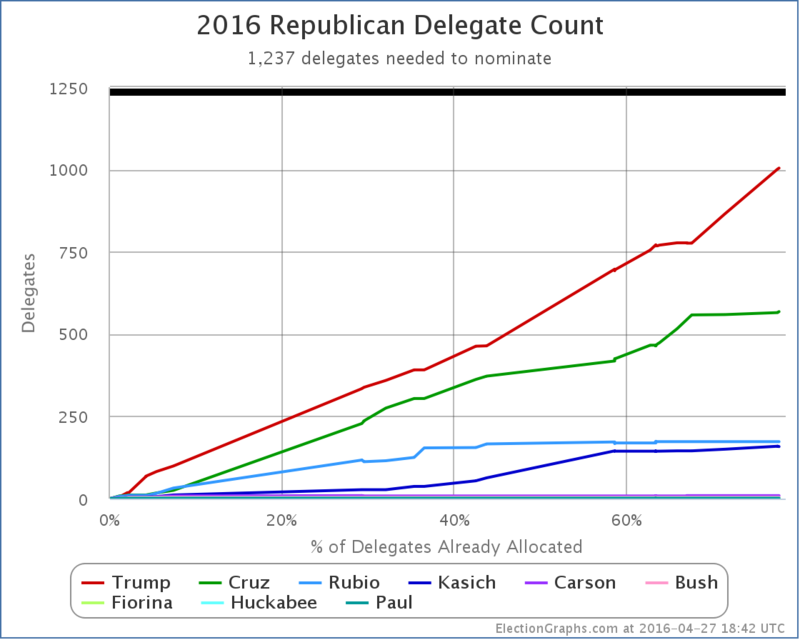 But all the estimates have Trump winning most of these delegates. Trump +155, Cruz +8, Kasich +8. The finish line is in sight. Trump only needs 233 delegates to win this thing directly. No multi-ballot convention, just a straight up win on the first ballot. For the first time since Super Tuesday at the beginning of March, Trump also actually has a majority of the delegates so far… 52.32% of the delegates. First note that with yesterday’s results Cruz has been mathematically eliminated from the possibility of a first ballot victory. Trump is now the ONLY candidate that can win on a first ballot. Everybody else is done unless there is a brokered convention… or I suppose unless Trump drops out or something crazy like that. Looking directly at Trump’s line… Trump needed 53.52% of the delegates to improve his position. Since New York he actually got 90.64% of the delegates. This obviously means his position improved a lot. He now only needs 42.06% of the remaining delegates to win. That means he could do 20% worse at delegate gathering in all the remaining contests than he has so far and still win. If the Republicans allocated delegates proportionately everywhere like the Democrats do, this would clearly be over. It would be Trump’s nomination, and we’d be done. Because of how so many Republican states tilt the delegate results to the winner though, if the anti-Trump’s were strong, there would still be a path to block Trump. The anti-Trump scenarios that gave us odds of a multi-ballot convention relied on three things. The first we mentioned above… Trump’s failure to win delegates when they were selected individually instead of being bound to primary results. Trump dispensed with that in Pennsylvania. The second was Indiana. Until the last week, Indiana had not been polled. The anti-Trump contested convention scenarios all relied on Trump losing Indiana. Well, last week Indiana was finally polled. Three times. The results? The RCP average has Trump +6.3%. Given Indiana’s delegate rules, a win like that would get Trump most of Indiana’s 57 delegates… possibly all of them. Oops. And Trump now only needs to be getting 42% of the delegates to be on pace to win. The third was California. Trump has been ahead in the polls in California forever. But the anti-Trump folks were hoping to keep him from winning by too much and to hold down his delegate total. But in the last week of polling, Cruz has been falling and Trump has been rising, so Trump’s margins have just been growing. RCP now has a 17.4% Trump lead in their California average. Assuming Trump wins Indiana and some of the other remaining states, Trump will very likely only need 30% or less of the delegates in California in order to wrap things up. If he is winning by almost 20%, that is going to be very easy to achieve. The simulator at The Upshot using default assumptions now shows an almost certain Trump win. The FiveThirtyEight simulator “follow the experts” model shows Trump 27 votes short of the magic number… but they don’t include ANY of the officially uncommitted delegates that have said they support Trump. Add those in… there are just under 50 of them now depending how you count… and you are easily over 1237. Finally, Sam Wang’s numerical simulations of the rest of the race have moved from a 64% chance of a Trump win a little over a week ago to a 94% chance today. I see no reason to disagree with this estimate. 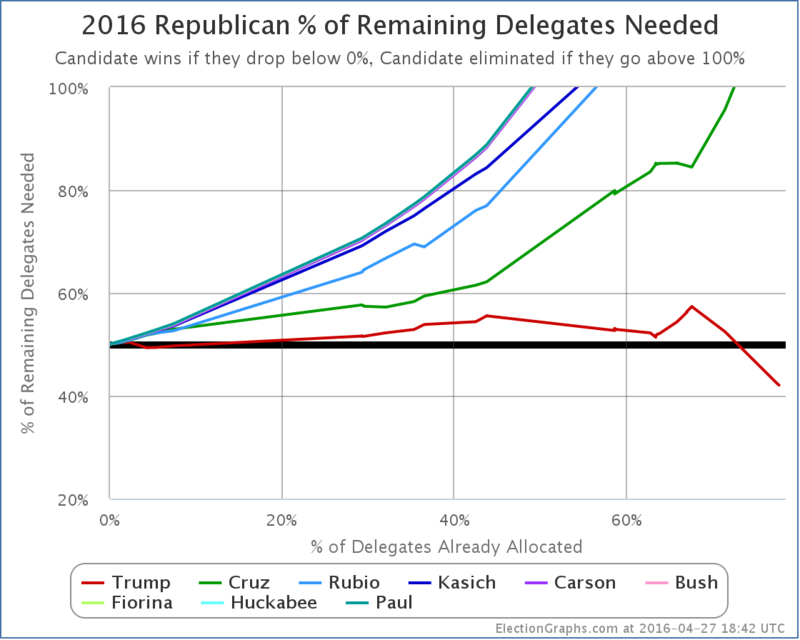 We are no longer on a knife’s edge between a contested convention and an outright Trump win. #NeverTrump is now hanging on by a thread. They maybe aren’t quite as far gone as Sanders is on the Democratic side, but it is getting close. Their last hope is to try to start turning things around with a surprise win in Indiana. Even with that though, Trump’s odds look very good. Between yesterday’s results, polls in Indiana, and polls in California, this now looks like an almost certain outright Trump win. This is now Trump’s to lose. Given everything he has done so far that pundits thought would sink him but in fact only strengthened him, it is hard to see how exactly that would happen. Update 2016-05-02 17:52 UTC: Uncommitted delegate update plus adjustment in Rhode Island. Net change: Trump +1, Cruz -2. Update 2016-05-04 08:11 UTC: Updates (including uncommitted) in Nevada, Wyoming and North Dakota. Net change: Cruz +6, Carson -2. Even the Sanders folks are starting… just starting… to admit it might be over. Clinton won 218 delegates yesterday. Sanders won 166. In addition, since New York there were new superdelegate endorsements and updates in Illinois and Ohio which have netted Clinton +9, Sanders +1. So including everything since New York, we have Clinton +227, Sanders +167. That means Clinton got 57.61% of the delegates. She only needed 28.73%. Meanwhile Sanders got 42.39% of the delegates. He needed 71.39%. In practical terms this has been for over a long time. Absent a huge unexpected event of course. But we still watch it play out. Clinton now only needs 231 of the remaining 1200 delegates to win. That’s 19.25% of the remaining delegates. Sanders on the other hand needs 971 of the 1200. That is 80.92%. Guess which is most likely? Or, of course, still, tons of Clinton superdelegates could defect and change this a bit. I wouldn’t hold my breath for that though. 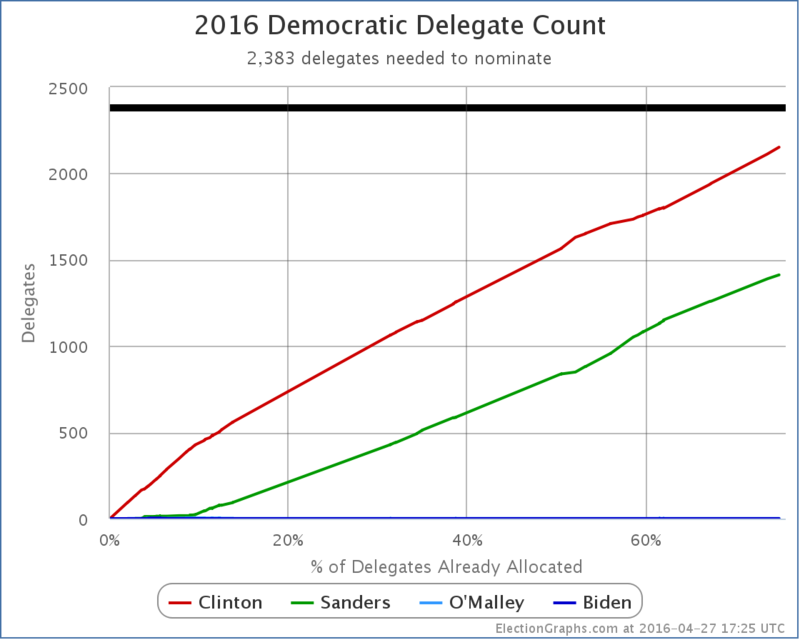 Update 2016-05-01 17:08 UTC: Superdelegate updates plus change to Ohio pledged delegates. Net change: Clinton +11, Sanders -1.